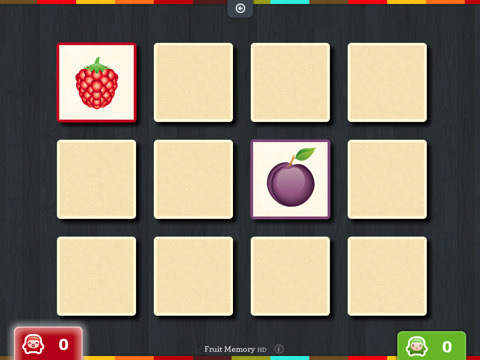 Fruit Memory HD is a simple matching game with cards. It is beautifully done and well executed. Adults might get a little bored but I expect kids will get hours of fun playing alone, with friends or even parents. You have choices of 1 through 4 players and a choice of 12, 28 or 40 cards. Developed by Paul Mayne the interface is simple and uncluttered. You start by choosing the number of cards, then the players and the “deal.” Each player then chooses an avatar to represent them in the gameplay. The active player’s avatar is highlighted and each tile clicked on turns over and displays a piece of fruit. If the two cards do not match they turn back over and the next player’s avatar is highlighted. If two cards match they disappear and a point is awarded with a happy animated avatar. The player that matches cards get to go again and repeats until not making and match. Gameplay continues until all cards are matched. At this point you can replay or back out and change options, card count or players. This game works very well with the iPad’s size and is set up so that multiple players are arranged around the screen as if it were a table making it simple for all four people to easily reach and read the screen. Right now this game is being offered at 50% off at $.99. Presently Fruit Memory HD is only offered for the iPad, but the developer is promising an iPhone version soon. AppSafari review of Fruit Memory HD was written by Blair Callicott on August 7th, 2010 and categorized under App Store, Games, iPad apps, Multiplayer, Puzzler. Page viewed 4711 times, 1 so far today. Need help on using these apps? Please read the Help Page.